I was originally put onto Coffee@33 by Horsham Coffee Roaster in 2013, which is when I first visited, Back then, Coffee@33 used legendary London roasters, Monmouth, along with the more local Horsham Coffee Roaster. Since 2015, however, Coffee@33 has roasted its own beans, first using a small hot-air roaster in the shop, then a more conventional gas-fired roaster in a dedicated facility. At the end of 2018, Coffee@33 returned to its original partnership with Horsham Coffee, roasting on Horsham’s new Loring roaster. Not only has this meant renewing ties with Horsham, but it signifies a return to air-roasting on a high-capacity, efficient machine. Coffee@33 serves a Brazilian/Nicaraguan espresso blend, accompanied by several single-origins. One is available on espresso, providing a contrast to the blend, while the others are available as pour-over using the Kinto dripper. 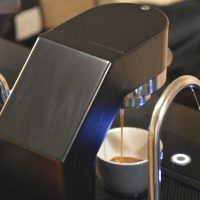 As well as the unusual choice of filter method, Coffee@33 is a trend-setter when it comes to espresso, being one a handful of UK shops to use the Mavam modular espresso system. If you’re hungry, there’s a selection of sandwiches, which can be toasted, and a wide selection of cakes and pastries to choose from, all baked on-site.